A small bark once rested near the bank of a river. Grounded in a shallow spot it was neglected as the seasons turned and it shed its outer skin. The frame of its construction became exposed and was also worn down by the elements. While it was worn it was also softened. In time it was gilded it in the manner of the northwest, with moss and lichens that clung to scarred ribs, giving it a patina like copper. 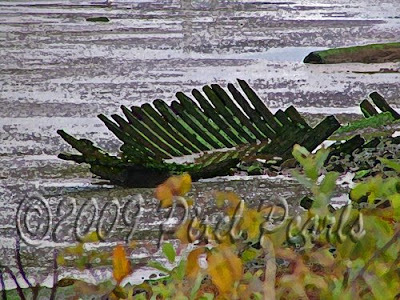 With its mellowing green luster this boat frame began to look like a leaf caught in the current and floating downstream. It blended with the brush on the shore and glistened against the gray currents around it. Humbled and broken, decayed and forgotten this small craft was transformed into an icon. It symbolizes the beauty of endurance. Though the ground we stand on may flood with dark water and the currents of time strip us of our protective shell and all that we thought made us watertight and able to float, in the end we find that floating wasn't everything. To remain and respond and adapt, to yield without backing down or giving up, is to acquire a beauty that will always have value. This original image was reduced in size and stripped of its detail. It was rather randomly adjusted and contoured. It was filtered and in the end brightened. What remains is an image I find meaningful and beautiful in its simplicity and fortitude. I don't know what it is with me and spiders exactly but I do seem to find quite a few opportunities to work with images of these interesting creatures. Many of those images are of garden spiders. In the garden I tend to admire spiders, though I admit they make me a little uncomfortable. In the house it is another story. That is my territory and spiders that make me uncomfortable inside usually have to go. But this little spider was so small and so well blended into it's surroundings that it hardly seemed threatening at all as it hung from a finely spun strand of web suspended from the ceiling. I grabbed my camera and captured this image as the spider hung in midair. 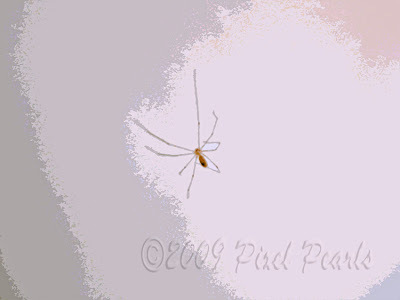 The spider's delicate features were easily drawn out of the digital data in the image though it's pale form hardly seemed discernable to my eye alone. I was also able to draw a bit of color and contour from midair and the ceiling beyond. Still the strand of web that held everything together remained invisible, a testament to the fine handiwork of this remarkable little creature. This image was captured by my husband on a trip to India. It speaks of a lively and colorful market he passed on his way through the city. 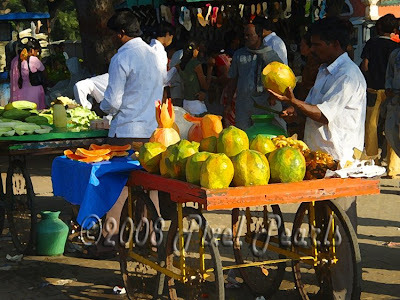 Each vendor has his offerings neatly arranged with as much visual appeal as possible. While this appeal is composed of many details it comes down to light and color. I cropped the photo and reduced the bit depth, highlighting the form, the color and the contrast of light and shadow. I think this draws us into the vision that inspired the capture and shares the beauty and creativity that can be a persuasive element in the art of commerce. This image was an interesting one to work with. I captured it on a golden afternoon in California a few months ago. 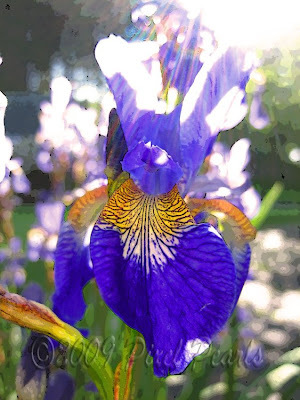 I liked the way the sun showered this beautiful iris and bathed it with light. I also liked the details in the petals of the iris. Still the iris lacked definition and the image lacked dramatic tension. To compensate, I took the image apart and tried to highlight and define the iris while letting elements of the background fade and desaturate. As the background began to dissolve it took on the character of colors blurring in the rain and of raindrops glistening in the sunlight that often follows a spring shower. I was left with a new appreciation of the sunlight and the shower motif and the blinding beauty of spring. In the end I'm not at all sure I got it right but I did have fun, and learned a thing or two, in the process of trying. In any case, this image of a spring sunshower makes me smile! A friend of mine captured this image when she was vacationing with her family in Paris. She shared it with me and I immediately wanted to work with it. 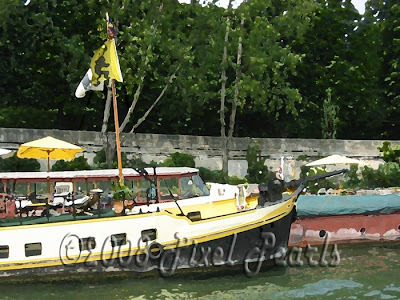 I loved the colors in the boat, the lush green of the banks of the river and the hint of international flair in the lines. Still much of that was submerged in the realism of the original shot. To bring out what I saw in the photo I brightened the image and contoured the line of the colors. By decreasing the bit depth I could feel the damp glow of the humidity and see the sunshine sparkle on the water in this picturesque image of an enchanting summer interlude abroad. Bookmarks are made from many of the images posted here. Bookmarks are created by focusing on a cropped section of an image that is particularly significant or interesting. These sections are then printed on high quality art paper. 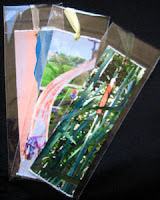 Each bookmark is 2"x 6" and has a ribbon at the top.